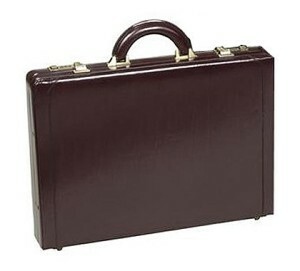 The classic box styled briefcase commonly seen carried by attorneys and lawyers, and featured in many James Bond and gangster movies is known as an attaché case. 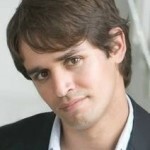 They portray an image of solidity, professionalism and have the cool factor. 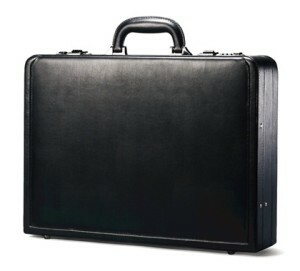 The following models are my top 10 best attache cases for men, in both leather and metal exteriors. 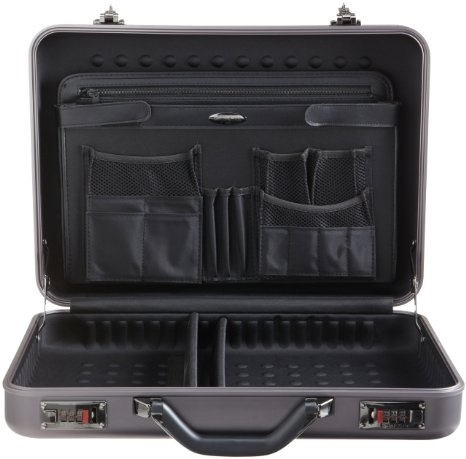 If you would like to compare each model side-by-side, you can visit my comparison chart for attache cases. 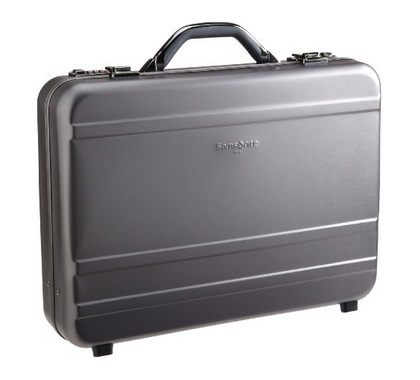 This gun metal grey attache case by Samsonite is simple, sturdy and stylish. It incorporates smooth rounded edges which presents a trendy look. There is enough space inside to hold up to a 17 inch laptop, documents, and all your stationary. The included two padded separator bars allow you to organize your contents easier. Your most valuable items such as your laptop, will be safe and secure via the padded ridged interior, hard exterior and double 3-digit combination locks. Carrying this case around is effortless as it’s lightweight and features a reinforced handle. 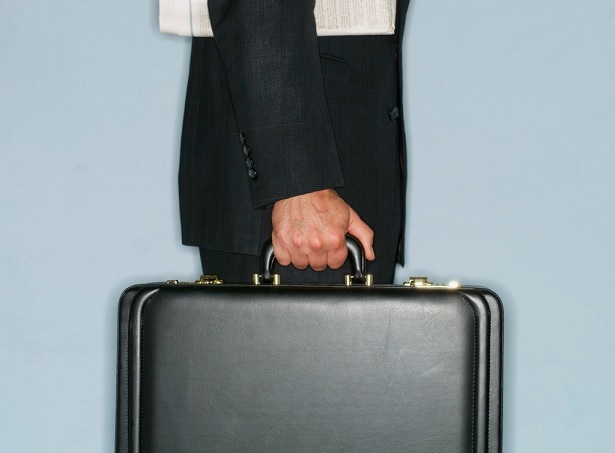 It’s perfect for you if your commute or profession means that your briefcase will be exposed to more risks. 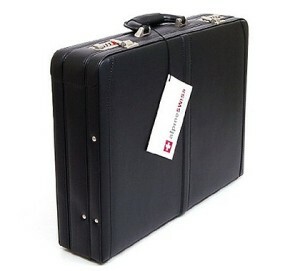 Now here’s a sleek, pure black genuine leather attache case that will make you look the part. There are no fancy stitching patterns or double colors, but rather, the appeal is in its simplicity. The interior is fully lined with a classic grey on black design, and has enough pockets and sections to organize and store even the most complex matters. The depth can also be expanded by an inch should you need more space. The padded leather handle is comfortable to hold and you’ll look nothing less than a top professional when carrying this around. 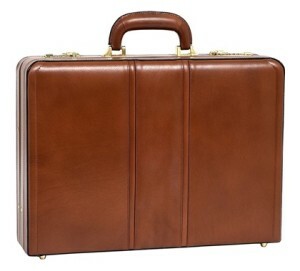 Crafted from full grain cow hide leather, the McKlein USA Coughlin attache case is luxury for a not so steep price tag. It’s available in a light brown (medium tan) color, and the classic black. The exterior encompasses two double lined stitchings at the center, with brass legs, combination locks and handle clasps, which stabilize the padded handle. As you open the case, you’re presented with an soft suede padded interior that looks even more luxurious than its exterior. There are three separators for all your files, two small pockets, card and pen holders, all of which match the exterior color. 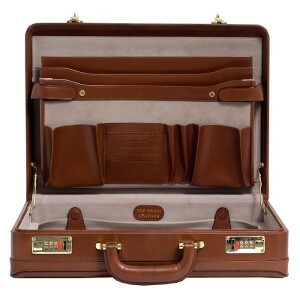 If you’re after a simple attache case with a hint of daringness, then the Alpine Swiss Expandable presents that, in the form of a full and thick leather exterior that features a double stitched lining that runs down the middle. A suede surface is prevalent throughout the interior, mixed with leather pockets and separators. Its 19 inch width provides adequate space for up to a 17.3” laptop, and the few inside holding sections are organized neatly, ideal for the simplistic man. At first glance, the front facing exterior of the McKlein USA Daley looks exactly the same as their Coughlin model, but once turned to the side, it’s noticeably thinner by 1 inch to be exact. When opened up, there are noticeable differences between the two models. The organized sections on the Daley are arranged and designed differently, and due to its thinner structure, it’s more practical for a thin stack of documents or laptop. However, it still retains its soft suede surface, brass clasps and combination locks, and also comes in black and light brown. 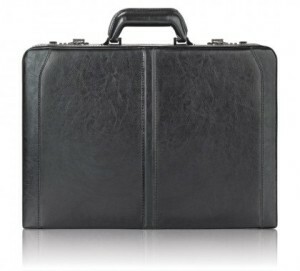 The Winn Executive Slim is one of the thinnest attache cases for men, measuring only 2.5 inches in depth. Weighing only 5 lbs, it’s also fairly lightweight. Its full grain cowhide leather exterior features an Italian style Trapunto stitching that runs through the sides and edges of the case. Antique brass locks, feet and handle clasps are incorporated on the Burgundy and Cognac color cases, and silver on the black case. Suede lining interior is used for Burgundy and Cognac, while the black case features faux leather. 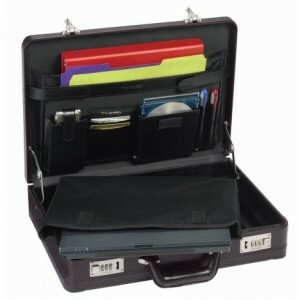 All have double file separators and a zippered front section that can hold business cards and pens on its surface. No matter what color you choose, the Winn Exec Slim remains elegant and professional. 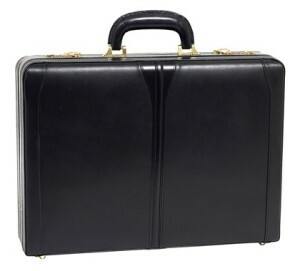 If you’re looking for a great value, simple attaché case, the Solo Classic 488 fits the bill. It comes in an all-black or burgundy design, with a straight to curved stitching on both sides, which gives it a real rugged look. You’ll find two main wide file compartments inside, which has the SOLO logo imprinted in the center. There are small leather pockets to hold notepads, pens, business cards and mobile phone. A removable thinly padded laptop sleeve, which is kept stable by two Velcro patches, comes included and can hold laptops up to 16 inches. There’s also room for expansion as the depth of the body can be expanded by 1 inch. Durability, professionalism and classiness are all terms used to describe the Delegate II Aluminum attache case by Samsonite. Incorporating a gun metal grey 100% aluminium shell, metal combination locks and a symmetrical metal handle and clasps, this attaché case certainly means business. 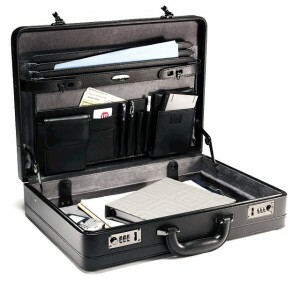 The all-black interior combines leather on nylon compartments and pockets to hold your documents and stationary. Your laptop or tablet will endure bumps and shocks while restrained with the straps in the protective padded foam compartment. 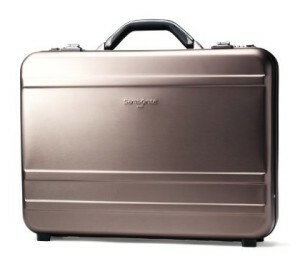 It’s incredibly lightweight at only 4.8 lbs, and guaranteed for 10 years by Samsonite. 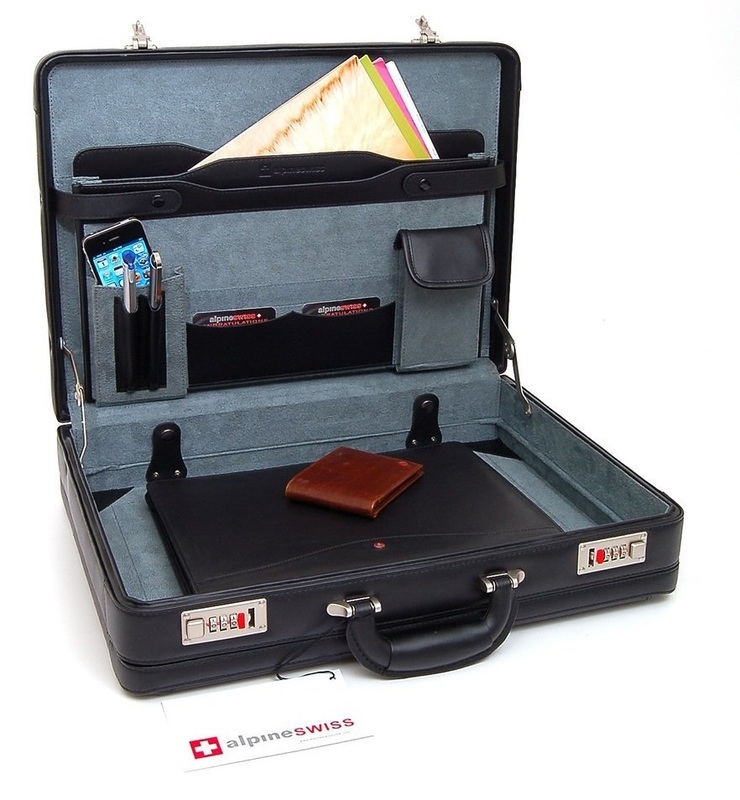 This briefcase is cool, subtly flashy but has substance to match. Another excellent briefcase by SOLO is their 471 model, which embodies a leather exterior with a matching texture, that presents a sense of grandeur. The lined stitching on both sides and the double stitching running through the middle displays power and confidence. Once you enter the interior, you’ll notice the double pen holders and the leather card holders in between two leather pockets that have flaps fastened by Velcro. One being ideal for your phone, and the other for a calculator or a small notepad. The SOLO logo is imprinted in the center of the first main file compartment, and the second compartment holds a removable padded sleeve that can hold a 16 inch laptop. Just as is the case with the 488 model, the depth can by expanded by an inch, allowing you to fit more documents inside. 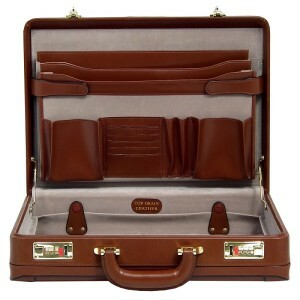 This simply beautiful leather attache case for men will make heads turn, with its slightly curved lined stitching at the sides and center. What makes it stand out is the fact that on the black version, the leather is glossy within the small section within the center stitching. For me, the brown version is even more impressive because of the black lining that runs alongside the stitching on the case and on the handle. Both versions have brass finished hardware. 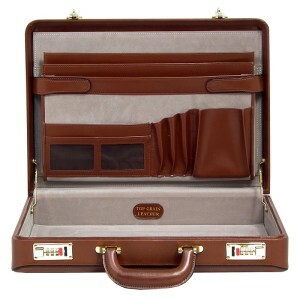 The interior features a similar quality design seen in McKlein’s other attache cases. It has a padded suede surface throughout with leather pockets that hold stationary and other small items. 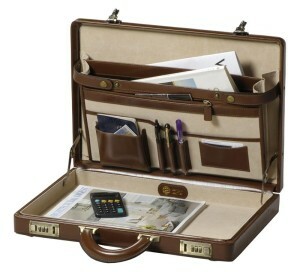 There are three main compartments for storing and separating your documents, all with a leather upper area. 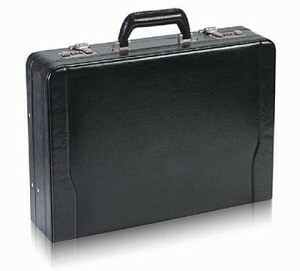 The McKlein USA Turner attache case is a thoughtful product that provides a much higher quality than what you pay for. 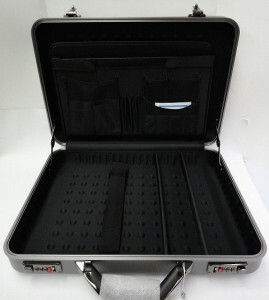 If you want to learn more about attache cases, I recommend that you read this article by WiseGeek. 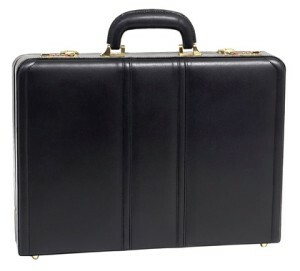 You can also compare the above men’s attache cases in my comparison chart by visiting this page.